(1935 - 2017) Sono Sensei studied Yagyu Shinkage-Ryu from the 16th Headmaster Otani Genshu for many years. Additionally, he received tutelage directly from Saito Jizaburo in Tokyo to learn Owari Yagyu Shinkage-Ryu. He became 17th Headmaster of the Yamato Yagyu-kai upon the passing of Otani Sensei. In addition to his background in swordsmanship, he is also a Shihan level instructor in Okinawan Karate. Sono Sensei is well versed in other traditional arts including kendo, jujutsu, traditional weapons, and Noh Theatre. Sono Seigo Sensei passed away on September 19, 2017, at the age of 82, after a battle with pancreatic cancer. Ogasawara Sensei joined the Yamato Yagyu kai at the introduction of Sugihara Iwao Sensei. Prior to Yagyu-ryu, Ogasawara Sensei spent many years practicing Shinto Muso-Ryu Jojutsu. With the passing of Headmaster Sono Seigo, Ogasawara Sensei has become the acting head instructor of Yamato Yagyu-kai in Japan. 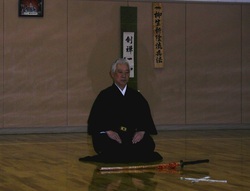 His high level of focus on the integrity of the Yagyu style and his personal training regime is unsurpassed. Manogue Sensei began studying Edo Yagyu Shinkage-Ryu in 1991 under Sono Seigo Sensei and Sugihara Iwao Sensei and holds the rank of 5th Dan. He is the acting head instructor in the United States. Manogue Sensei also holds the rank of 5th dan in Aiki-kai Aikido and runs an aikido dojo in New Jersey. In addition to traditional Japanese arts, he has also trained in modern martial arts in the Jeet Kune Do curriculum including, Jun fan gung fu, kali, silat, muy thai, capoeria, braziliian jujitsu, and savate. He travels to Philadelphia on Saturdays to teach Yagyu Shinkage-ryu Heihou. Walter Sensei started his martial art career with Shotokan Karate in 1986. Soon after, he began studying Tai Chi Chuan, which he continues to practice under various instructors. Walter Sensei studied Yagyu-Ryu under 17th Headmaster Sono Seigo and Sugihara Sensei from 1991 attained the rank of 4th Dan Kyoshi. Additionally, he holds Okuden rank in Niten-Ichi-Ryu Kenjutsu from Miyagawa Morito Sensei of Otsu, Kyoto Prefecture, and 2nd Dan rank in Daito-Ryu Aiki-jujutsu Takuma. In addition to teaching Yagyu-ryu, he also teaches Niten-Ichi-ryu. In 2011, Walter Sensei relocated to Memphis, TN. _Hailing from New Jersey, Chris deMonch started in martial arts training in TKD, Karate, and Judo. Upon moving to Philadelphia for college, he began training in aikido, through which he met Manogue Sensei. Chris has been training in Yagyu Shinkage Ryu for over 15 years, and continues to oversee practice in Philadelphia on the days when Manogue Sensei is not present. Arthur Fain started his career in 2004 in Hapkido and Toyama-ryu Batto-do. He began his studies of Yamato Yagyu Shinkage-ryu and Niten Ichi-ryu in 2008, under David Walter Sensei. In 2011, Fain Sensei became the head instructor of the Tampabay Dojo, where he has taught ever since. He currently holds the rank of 3rd Dan in Yagyu-ryu. Fain Sensei also hold the rank of 4th Dan in Niten-Ichi-ryu Heiho Kenjutsu, under Miyagawa Morito Sensei of Otsu, Japan. When not training in Niten Ichi-ryu Kenjutsu or Yamato Yagyu Shinkage-ryu, he has often traveled to the Ka Muso Kai dojo in Calgary for training in Choken Battojutsu Kage-ryu, under Colin Hyakutake Watkin Sensei. 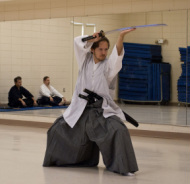 Fain Sensei has also dabbled in Tendo-ryu Naginata, Seitei Iaido and Jodo, and Shurikenjutsu.